As a child, I used to like drawing pictures of medieval castles. These drawings always took a similar form: a large square in the middle of the paper, two taller turrets on either side, and a wall that extended the remaining length of the page on either side. I even owned a stencil that had a guide for making square waves that I used on the upper edges of each part of the picture. For a frontal, ground level representation by an eight-year-old, I actually think I did pretty well, having depicted the three key components of the average medieval English castle: the keep, the tower, and the curtain wall. If asked to reproduce this same drawing from an aerial perspective, however, there’s much I would’ve inadvertently left out. With this in mind, when examining the external parts of a medieval castle, they can be divided into two main categories: those that were defensive in nature and those that were not. The defensive structures – the notable ones most likely to be included in a child’s drawing – were all made of stone. According to Joseph and Frances Gies, authors of Life in a Medieval Castle, the design of castles in western Europe was largely influenced by the techniques of the Turks and Greeks the westerners encountered during the First Crusade in the 11th century. Among these techniques was the widespread use of masonry as a building material. Prior to this, although some stone castles already existed on the Continent (and a good many more castles in general than in England, which accounts for the relative ease with which William the Conqueror took over the country), most early English strongholds took the form of motte-and-bailey style castles. The first line of defence in a post-Crusade castle was the curtain wall – a structure that surrounded the entire collection of castle buildings and might have stood 40 feet high or more. The wall – like all of the stone buildings of a castle – was built with a shell of whatever stone was locally plentiful and a core of stone rubble mixed with mortar. All stone buildings were also “crenelated” or “embattled”, meaning they contained battlements of square spaces (crenals) that alternated with square solid parts (merlons). Atop the wall was a pathway spanning its entire circumference known as the wall walk, which men-at-arms used to patrol the castle grounds, to look out on potential approaching enemies, and to take up position to attack (and then take cover) amongst the battlements. Below the battlements, the wall might also contain meurtrières (“murderesses”) or arrow loops – narrow vertical slots through which arrows could be shot – and below the arrow loops, machiolations – overhangs with holes through which missiles and boiling liquids could be dropped on attackers. The wall was further strengthened by towers, which rose even higher and were spaced such that defenders could maintain control of the intervening wall panels. 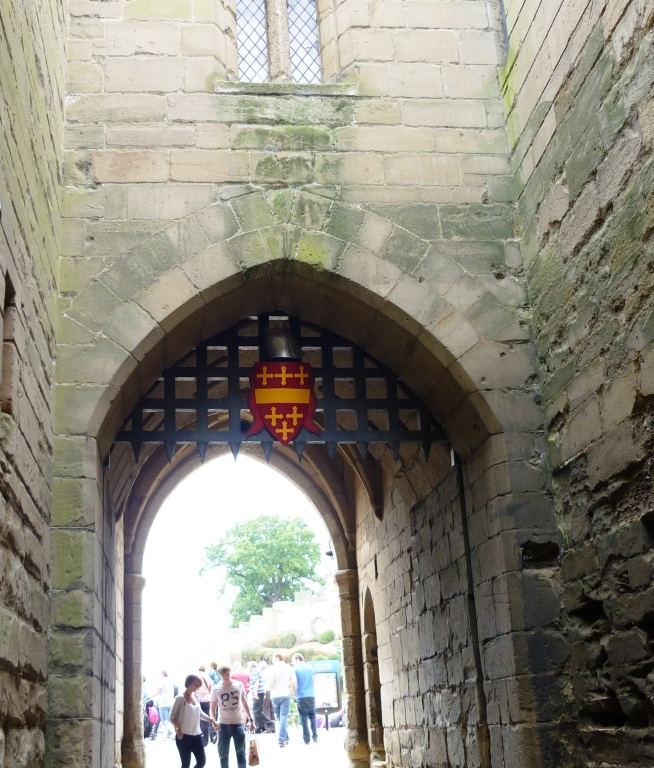 The main opening in the wall – the gate – was often protected by a gatehouse, which contained the controls for the drawbridge (that may or may not span a wet or dry moat) and the portcullis – an oak and iron vertical sliding door. The space enclosed inside the wall was known as the bailey, of which there were usually two – outer and inner – as separated by a section of wall bisecting its circumference and perhaps another, less elaborate gatehouse. Not only would the inner bailey be backed onto higher ground, it also contained the keep – the last line of defence in a castle where all fighters, castle residents, and peasants from the surrounding village would retreat to make a final stand against their attackers. Solidly constructed, often turreted, usually rectangular but sometimes with a round exterior (a chemise) overtop a rectangular interior to eliminate the corners that were so vulnerable to sappers and battering rams, some keeps had walls that were 60 feet or more high (the keep of Dover Castle, renovated by King Henry II in the late 12th century, had walls that were 83 feet high and 17-21 feet thick). 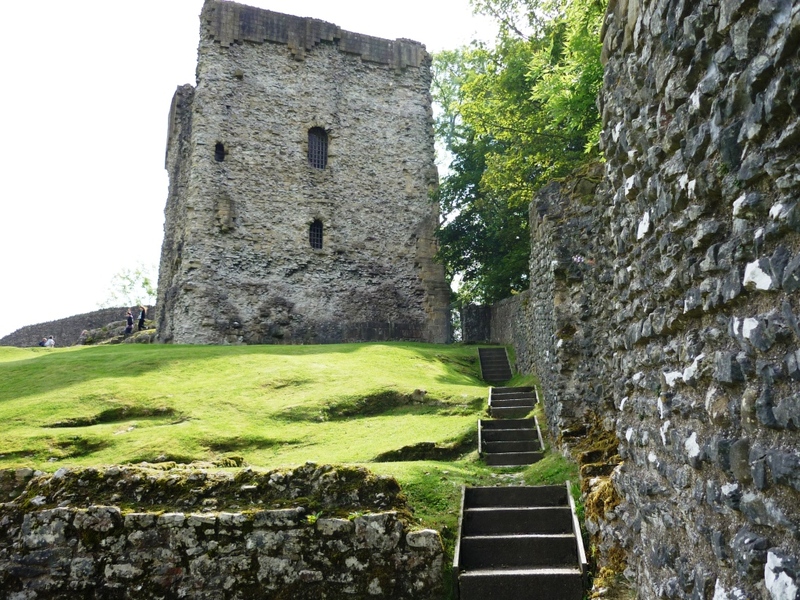 The keep was usually entered on the second floor via stairs on the side of the building. At times, for even more protection, these stairs were contained in and protected by a forebuilding. 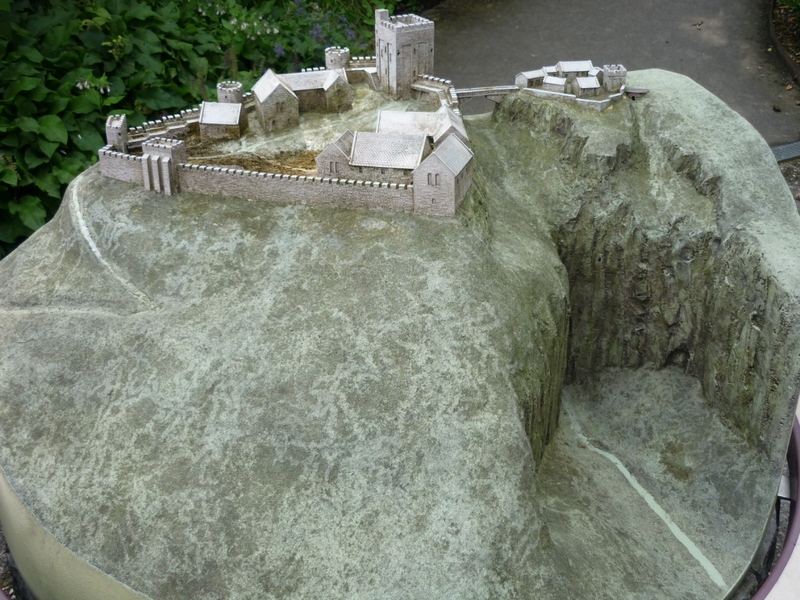 Scale model of Peveril Castle, showing the keep, numerous outbuildings, a gatehouse, and a drawbridge spanning a ravine separating the inner and outer baileys. The wooden buildings of a castle – or outbuildings, as they were referred to – were concerned with day-to-day living rather than defence. Outbuildings could be found in both the inner and outer baileys, and some of the more common types included the kitchen; the stables; the farriery, where horses were shod; a pigeon loft; a dairy, and a public chapel for the other members of the household since the castle’s noble family usually had a private one. Often outbuildings were connected by a series of covered passageways (likely as shelter from inclement weather) that in turn connected to the keep. These passageways could be moved around as needed as outbuildings were relocated, burned down, or were intentional dismantled. Beyond that, extra outbuildings might be casually constructed to accommodate unforeseen purposes like sleeping quarters for guests or barracks and mess halls for mustering soldiers, or simply because the castle contained enough lines of defensive fortification for the noble family to feel safe giving up the keep as their residence in favour of more spacious, comfortable living quarters. A/N: In next month’s post, I’ll discuss the interior layout of a more conventional keep as well as the general living conditions in a medieval castle. This entry was posted in Building a History, Medieval Mondays, Writing and tagged 13th century, Historical fiction, History, I've suffered for my Art, Medieval castles, Medieval times, Novel, Novel writing, Research, The Middle Ages. Bookmark the permalink. I love castles and fortresses…they are fascinating structures! Me too! So mythical and romantic.